Real Progress on my Theater! Finally, an update on my quest in to the depth of the darkest of man-caves on a journey to build my own home theater. 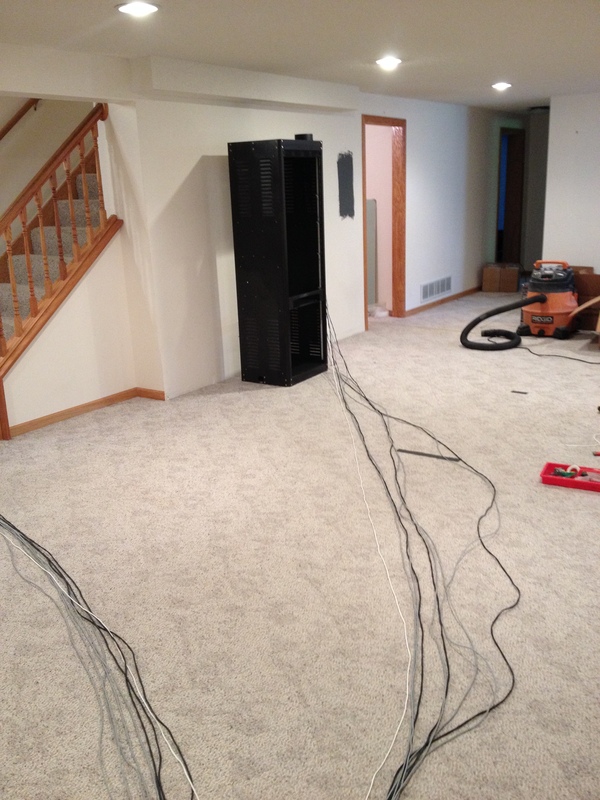 We made some real progress on Sunday running wire for roughly 80% of the necessary speakers and gear. I know a lot more about good home theater design than I do about physically getting cable from point A to point B, but I did have help, and in the end I learned a lot. In a nutshell we managed to pull cable from the rack location to the front of the room near the screen location for left, center, right, sub1 and sub2. From there, we managed to get power and cable to two rear speaker locations as well as the projector. You may wonder about “Dolby height speakers” or some ceiling speakers for the new Dolby Atmos format. The reality is that I want to run cable to all of my rear speakers and look at how much bulk cable I have left before I commit to any height channels up front. Additional, ceiling speakers in the recommended Dolby Atmos locations would be exceedingly difficult to get wire to. Doable, but a whole days project. Ok, pics.. and more details than you care for…. 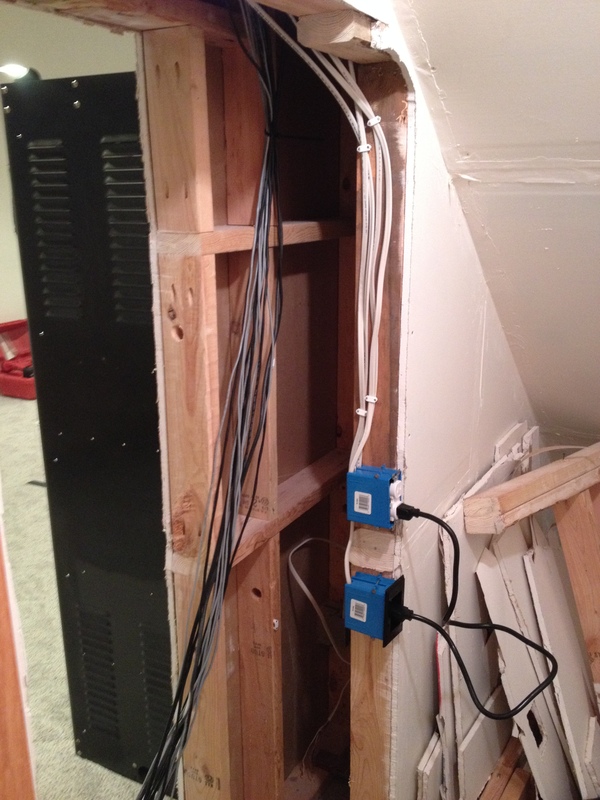 Here is almost all of the wiring coming in to the location where the rack will sit. Finding a route to the front of the room was a real trick as the stair case is in the way. At first we thought we would follow an HVAC duct on the opposite side of the closet and stair, however that turned out to be a dead end. We ended up going over the top of the HVAC duct to the bathroom taking a left and going over the top of the ceiling of the laundry room. Figuring that out was literally an hour and a half of head scratching, putting holes in things I probably didn’t need to, and playing with a glow rod. By the way, if you want to run cable buy a glow rod (a tool now on my “wishlist”). Once we had the route figured out, we then sent a line of coax that came pre-marked for length in terms of footage out of the box back to the rack. With a length of roughly 75 feet, we measured out a bunch of cable lengths for each speaker location to run and then taped it all together to the other end of the rod to make the run back out to the rack in one shot. 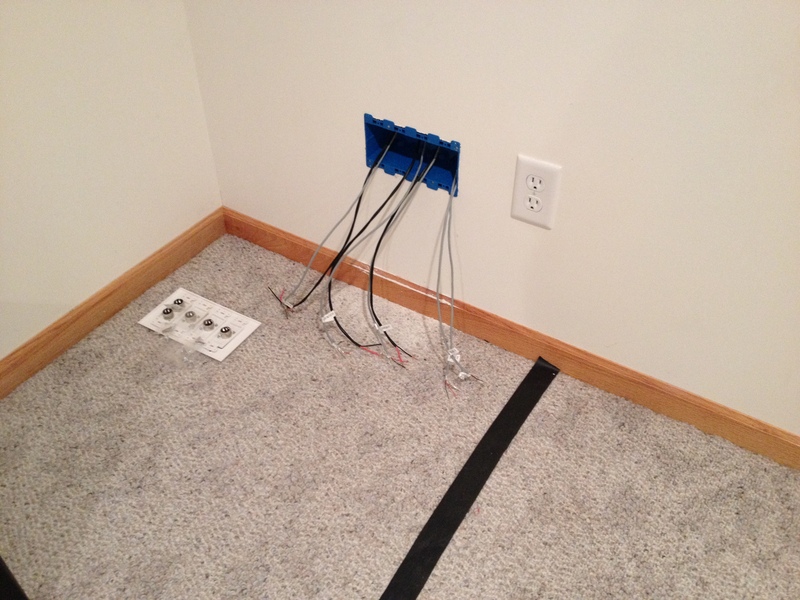 Here we are measuring out the lengths of each cable needed to go to the front of the room. Finally made it to the front of the room. The four gang box will be on the wall behind and to the side of the screen itself. The screen sits in front of an exterior wall and it wasn’t worth the hassle of pulling the cabling in to that wall space. This essentially will be in an alcove behind the screen you’ll never see any of the cabling that comes out from this location. Wall connection box for Left,Center, Right, Sub1 and Sub2. The back side of the same box for anyone curious. The rear speakers offered up a different challenge. 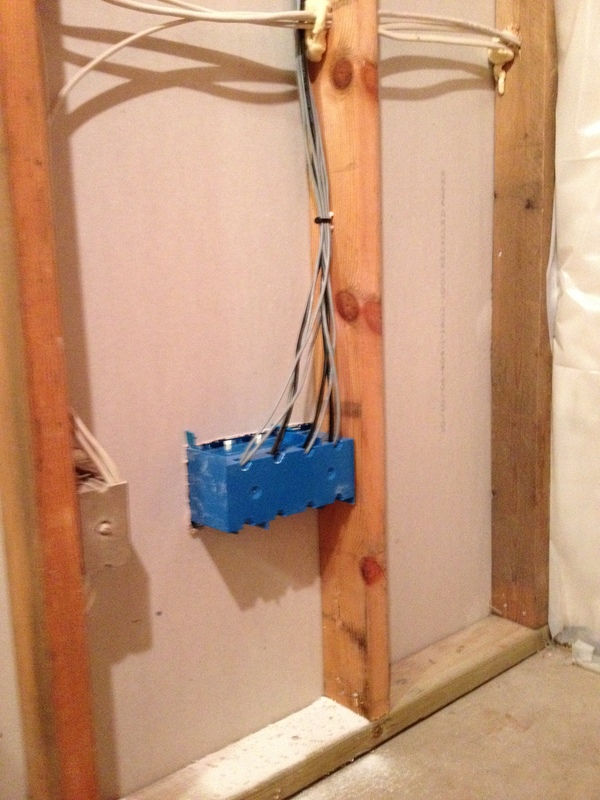 For the left surround, we had to cut a small hole near the top of the wall to run the glow rod through back to the rack, above the ceiling sheetrock, as well as to feed cable downward past the wall header to where the two gang box would sit in the wall. So, as as you can see I have some drywall repair to do, otherwise I could just cover it up with a blank wall plate. This box should sit mainly behind the rear left speaker on the wall. Unusual in home theaters, it contains both electrical power and a choice of two types of audio connections (balanced XLR, and regular speaker cable). The unused audio connection will just stay wrapped up in the box and can be switched out with a different faceplate at later time if wanted. 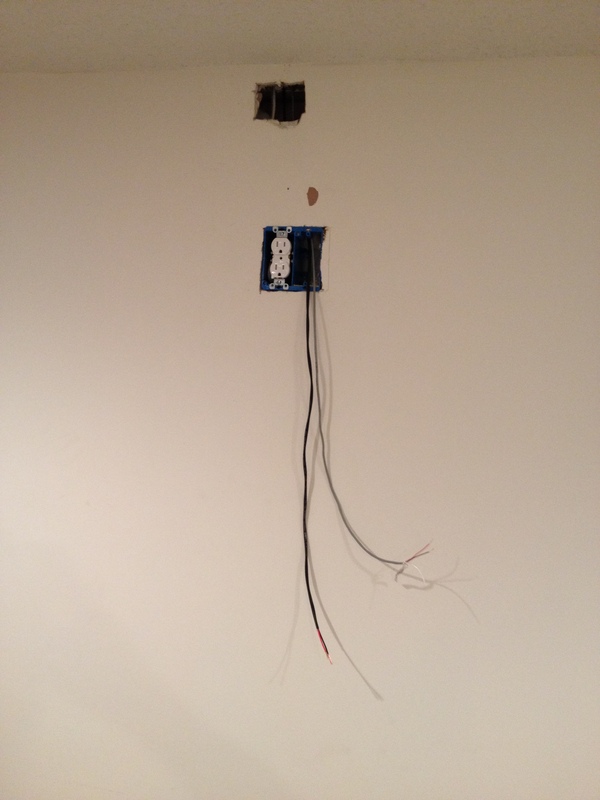 After the rear speakers boxes were wired, we focused on getting power and HDMI to the projector location. 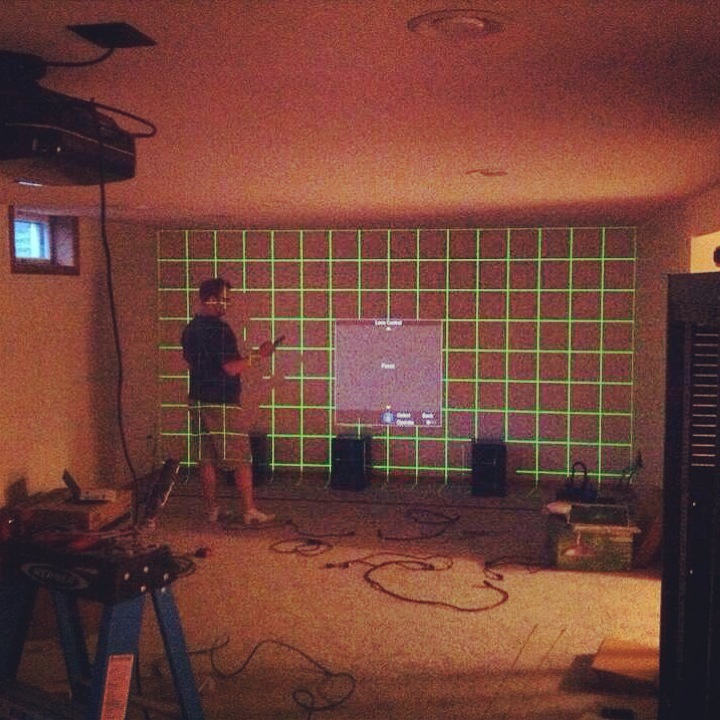 We also hung the projector to double check the geometry and see how much play we had with the zoom for that location. You can really see how low the ceiling is in this picture. You will definitely will make a shadow if you stand up a couple feet in front of the main seating position. I wish I had a taller ceiling, but it is what it is. Just testing on the wall for now. In the future a screen will sit roughly where the black taped line is. Anyway, I still have a lot of work left. Unlike most home theaters, my wall plates use XLR connections typically found in musician/pro audio applications and they all need to be soldered to complete the connection. The terminated XLR cable ends at the rack location need to be soldered too. Guess I’m going to have to get better at soldering! I really need to get the rear surrounds in, and have a pro figure out how to get the outlets at the rack location on a separate breaker. The system is close to usable now, but only then can I call the wiring “complete”. More to follow, hopefully updates come a bit quicker now.